This boy decided to scare his little sister. He knows that she is a very brave girl, thus it won't be so easy to scare her! You must create a hitherto unprecedented monster and try to make your sister be afraid of him. Your younger sister is a very brave girl. She seems not to be afraid of anything. But today she exasperated you, and you finally decided to take revenge over this nasty little creature. Try to create a horrible monster to scare her and to drive her away from the house for at least one night! 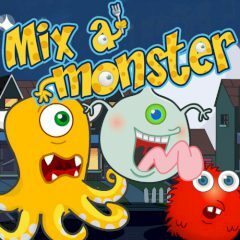 This free arcade gameis really very funny, so you surely will not be disappointed if you play it! Have much fun with this amazing game which had been developed by Agame!